Fork and the Road restaurant bike tour Reviewed by Edgeville Buzz on June 19, 2009 . 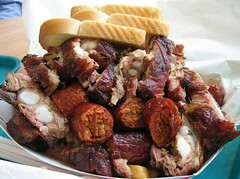 Sample the rib tips and hot links of one talented pitmaster from Arkansas. Try your hand at grilling meats Korean-style over live coals. Ride up to Devon Avenue and discover the wonder of chicken seasoned with Pakistani spices. Make a stop at our favorite Chinese hole-in-the-wall for succulent pig, duck and chicken.